Gamophobia is an exaggerated or irrational fear of marriage. 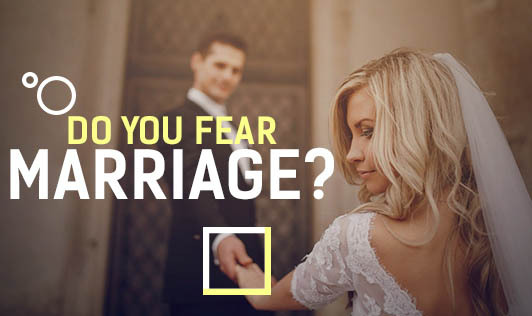 A person who is afraid of marriage may have no issues having a lifelong relation with their partner, but are horror-struck at the thought of getting hitched. All phobias are quite unique to each person but can often be generalized. The phobia of getting married or being married has nothing to do with being committed, but with being in a married relationship. Many mental health professionals suggest that Gamophobia is maybe a result of divorce, or a result of not being raised in an environment where parents were married or they have an underlying anxiety condition that is overstated by their fear of getting married. Avoidance is one the main symptoms of Gamophobia. When an individual is faced head on with the thought or even the idea of marriage, the individual may begin to panic, have a rapid heartbeat, may run short of breath, tremble and even have feelings of terror and fear. Gamophobia can be treated and cured with the right treatment. It's important for the individual to talk about the ins and outs of marriage with a loved one such as a parent or a close friend. In extreme cases, the individual may have to see a mental health professional. The fear usually has underlying reasons; it requires an experienced therapist to indentify the root cause. This will help the individual understand why he or she had false assumptions about marriage and the real picture of what a marriage really is. If you or your loved one has Gamophobia and is in a committed relationship, it's very important that you become more informed about the phobia as well as tell your partner about it. Your partner should be able to understand your love and loyalty and your willpower to surmount your irrational fear of getting married. • It's important for you to determine what exactly you're scared about. Most people are not scared about marriage itself but rather its implications and potential failure. • Talk it over and express your concerns to your partner. So, don't be afraid to speak about your fears to your loved one. By gaining awareness about the healthy sides of a marriage, you will be able to manage your anxiety about getting hitched!